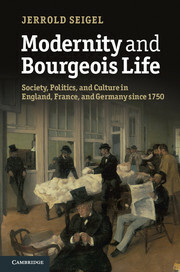 In an exclusive interview, Professor Jerrold Seigel of New York University talks about his ambitious and highly original new book, ‘Modernity and Bourgeois Life’, which offers a panoramic view of the ties between modernity and bourgeois life in Western Europe. What inspired you to research this subject? I’ve long thought that making sense of the relationship between modernity and bourgeois life is crucial to understanding how the world we live in came about, how it differs from the past forms of life out of which it developed, and the roles particular kinds of people play in it. A great deal of work by historians and others has recognized this in one way or another. I was already trying to deal with these questions, less explicitly and with less awareness, in some of my earlier writing, especially my books on Marx (who assigned bourgeois people a crucial role in modern history) and on French bohemianism (which rested on a much closer relationship to bourgeois life than has often been supposed). I have also had to confront these questions often in my teaching, which came together with my research and writing to give me a deepening dissatisfaction with the ways they have usually been dealt with. Reading Georg Simmel’s brilliant book ‘The Philosophy of Money’ turned on a kind of light bulb in my head. Simmel’s notion that money is a “social tool” allowing people to act through “long chains of connections” led me to think about modernity and bourgeois life in relation to the growing weight of distant relations in people’s lives, and thus to the extension and thickening of what I call the “networks of means” that provide vehicles for them. What did being ‘modern’ mean to Europeans in the nineteenth-century? such as machine production, party organization or some kind of liberated individuality. “Modern” could have negative connotations as well as positive ones, for instance having a kinship with decadence or moral decline. A certain number of nineteenth-century people recognized that modernity had much to do with the spread of distant relations of one or another kind, a perspective to which I give some emphasis, since it is close to the one I try to develop in the book. Modern is a very slippery term and I think we can only use it well if we don’t try to restrict it too much, accepting its plasticity and resistance to any single definition, and recognizing that we can’t use it to mean exactly the same thing in reference to different phenomena or historical moments: the Enlightenment and even the Renaissance were modern in some sense, but not in the same one that applies to the new conditions of life that were emerging after about 1850. What role did the European bourgeoisie play in the drive to modernity? alone in doing this. There were some bourgeois who resisted most every kind of modernization, and others who stood against the different forms of it promoted by people who were not bourgeois, such as Napoleon III in France and Bismarck in Germany. Is it possible to draw any parallels behind the motives for this drive in the nineteenth century and Present day? Because I try to highlight those aspects of modernity that come to be more prominent as networks of means that grow more extended and thicker, giving relations at a distance greater weight in all aspects of life, Modernity and Bourgeois Life suggests that strong threads of continuity tie the nineteenth century to our own time. The internet is a network of means too, with important roots in earlier ones, and this is what allows me to conclude the book with a section on “The Internet in the History of Networks,” looking into similarities between its impact and that of earlier instruments of work and communication such as the printing press and the telegraph. Concluding a book that mostly deals with the period 1750-1914 by discussing something that belongs to the twenty-first century may raise some historians’ eyebrows, but I hope to convince them that it makes sense to do so. How does Modernity and Bourgeois Life fit within your wider academic interests and research? I draw on some of my own earlier work at various places in the book. The understanding of Marx’s career I developed in Marx’s Fate provides one component of the emphasis I give to the period just after 1848 as a general turning point, and the new book gives a summary account of his economic theory that supports this connection. The analysis of relations between bohemianism and bourgeois life I proposed in Bohemian Paris provides one ground for the general argument I make in Part III about the ways art and culture developed in connection with both bourgeois existence and the expansion and thickening of networks of means, and Marcel Duchamp, to whom I devoted a short book in 1995, appears here as s signal instance of where these connections could lead. My book on The Idea of the Self undertook a comparison between English, French, and German developments that parallels the one I propose here. But my ability to write this book owes at least as much to my teaching over the years as to my research, since I’ve often focussed on social and political history in my teaching, whereas my other published work treats intellectual and cultural topics. Have you got plans for more books in the future? And finally, can you describe your book in three words? Ambitious for sure; responsible and thoughtful I hope.